If you’re looking for a well sized traditional timber shed that will withstand all that the UK weather throws at it, then this could be just what you’re looking for. Its heavy frame gives it excellent stability, yet it’s also lightweight and easy to manoeuvre during assembly. Thanks to its unusually tall eaves and doorway as well, you can fit more inside than you might at first think. The frame wasn’t the only component that we particularly liked the look of, as it was good to see that the manufacturers had also used high quality PAR tongue and groove cladding throughout. This gives excellent rain proofing qualities, particularly as it’s also used for the apex roof which is then given further protection by its felt covering. It also creates a tough substrate that outperforms standard cladding. Weather protection is provided by both the apex roof and the tightly interlocking cladding, and protection against potential theft is provided by the inclusion of a key operated lock. It shows that security is being taken seriously, and this is further demonstrated by the use of tough horticultural glass in the six windows, four of which are fixed but two of which are opening to allow natural ventilation. We liked the look of this wooden apex shed from the moment we saw it, thanks to its combination of a traditional timber design with smooth tongue and groove cladding. It adds a touch of elegance to what often looks rustic, and the six windows also contribute to a luxurious appearance that you’ll be happy to see in your garden. We were pleased to find that the apex roof is constructed of tongue and groove timber, as this gives it added durability when compared to the solid sheet material that we sometimes see. It also adds even more vertical space to what is already quite a tall garden building, with a ridge height of 2.46m and an eaves height of 1.83m. 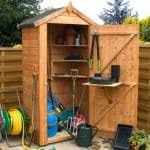 The overall width of this shed is 2.44m and the overall depth is 3.66m. We’re used to seeing 12mm thick tongue and groove cladding such as this used on timber sheds in this price range, but on this occasion we were particularly impressed that PAR cladding had been used. Its planed structure gives added toughness and rigidity, meaning that it’s equivalent to 16mm of standard cladding. Also impressive was the heavy duty frame, which with a thickness of 44 X 44mm was considerably more sturdy than most we see on the timber sheds and workshops we review. Whilst the floor itself seems to be strong and reliable, thanks to it using the same cladding found on the walls and roof, we are concerned that it doesn’t feature integrated floor joists. We feel it’s essential to keep a floor of this size elevated above ground level, or else ground moisture can quickly lead to rot taking hold. That’s why we would recommend the set of floor bearers as a necessary purchase rather than an optional extra. Rot is the natural enemy of an attractive shed such as this, so just as we were disappointed to see that floor joists weren’t included, we were also disappointed to find that the timbers had only been given a basis dip treatment of preservative. At this price, we would have expected pressure treatment to have been used, which gives much more effective, and longer lasting, protection. 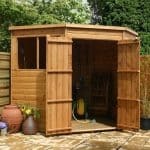 This lack of treatment could also be a contributing factor to the short one year warranty provided by the manufacturer, which we feel should have been much longer for a shed that costs more than a thousand pounds. It also means that the shed has to be retreated annually, and it also requires treatment by the customer within six weeks of it first being installed. One area that we feel the shed does score highly on is in its door and windows. The door itself is a single hinged variety, yet its opening was much more generous than most we see. With a width of 07.76m and an unusually accommodating height of 1.88m it’s very easy to walk in and out, and to carry tall or wide objects in and out. Thanks to its generous height, we can easily imagine this shed being used as a small workshop and natural light and ventilation are both essential for this purpose. The six windows more than adequately take care of these requirements, especially as two are fully opening as opposed to the other four which are fixed. It was also good to see that horticultural glass was used for the glazing, which is both tougher and more shatter resistant than standard glass. We take shed security very seriously, and we know that many shed owners see it as a priority when deciding which to buy, so we were very pleased that a key operated locking system had been included as standard with this shed, unlike many that we review which place the emphasis on the customer to source and apply their own lock. It works very well, and it also looks very professional, which in itself can be enough to deter opportune thieves from attempting to break in. Whilst we think the windows are an excellent feature on this shed, we know that some people will be concerned that they allow passers by to see what’s stored inside the shed. That’s why we also welcome the opportunity to have a fully boarded and window free version, at no extra cost. It’s an ideal and security enhancing customisation for those who are going to be storing items of value. There is also the option to change one further fixed window to an opening window, at a cost of £31.99, and for £56.99 the door can be upgraded to a double door with a 5’ opening width. As mentioned earlier, a set of floor bearers are also available, priced £61.99. With such an important role to play in rot prevention, we feel these should have been included as standard. Each component was well manufactured, and the use of PAR cladding across all surfaces shows the attention to quality; even the frame featured chamfered edges. Whilst the cladding itself offers good resistance to water and rot, the failure to use a pressure treatment and the lack of floor joists can have a negative impact. The base itself is generously proportioned for most small or medium gardens, and this is further helped by the tall eaves and ridge heights. 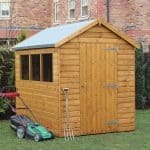 For such a well proportioned shed this is surprisingly easy to put together, thanks to the comprehensive yet clear instructions. With a friend’s help, you can have the installation completed in around four hours. 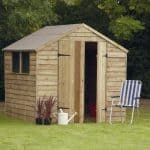 The quality of this shed is good, as is the storage capacity offered, but we’ve reviewed much cheaper sheds of a similar size that also come with longer warranty periods. 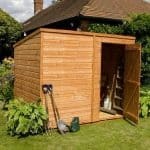 Final Thoughts: If money isn’t as important a factor to you when buying a shed as quality is, then this is a garden building you’ll want to consider. 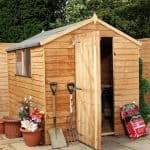 It certainly isn’t the cheapest timber shed of its size we’ve reviewed, especially when the extra cost for the necessary floor bearers is taken into account, and there are areas in which we think improvements could have been made such as the warranty period and initial preservative use. 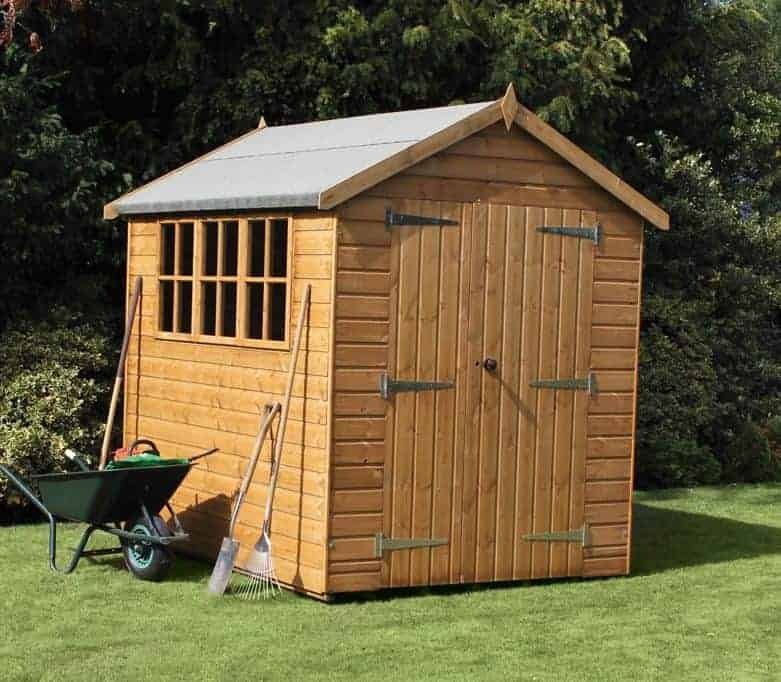 Nevertheless, it does have a lot of features that we welcomed, such as the tall door and six windows, and the key operated locking system, and it’s certainly a good looking shed that you’ll be proud to have in your garden.